Published on 8/18/2018 @ 12:03 a.m.
NEWPORT NEWS, Va. – The list of milestone moments for Allen Iverson is longer than an NBA court. 94 feet isn’t enough space to talk about the impact the Hampton native left on the game of basketball. Iverson’s most recent feat is one he is just as proud of as winning an NBA MVP award — remodeling the same basketball court he grew up playing on. “It’s just a great feeling, I don’t have any words for it,” Iverson told News 3. Friday at the Greater Hampton Roads Boys & Girls Club in Newport News, ‘The Answer’ and his family cut the ribbon on a brand new basketball court. It’s something that he didn’t envision happening when he was a youngster playing on that court. Iverson did that, and became a four-time scoring champion in his fourteen NBA seasons. The Naismith Basketball Hall of Famer has inspired a generation of youth that barely got to see him play in his prime. 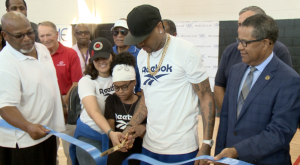 Reebok, Iverson’s longtime shoe sponsor, partnered with him to donate 150 backpacks filled with school supplies, and sent kids home with tennis shoes as well.